“We could not have picked a better week to address this topic,” said Larry Caldwell, University of Redlands distinguished fellow and an expert on international relations between the United States and Russia. Caldwell’s talk, part of the Redlands Forum series co-hosted by Esri and the University of Redlands, took place on February 7, in wake of the Trump administration’s move to withdraw the United States from the Intermediate-Range Nuclear Forces (INF) treaty. The INF treaty, a nuclear disarmament agreement between the United States and the Soviet Union, was signed in 1987 and expired on February 1. Caldwell spoke to the political implications of the relationship between Presidents Donald Trump and Vladimir Putin. Providing a short history of the United States’s harried relationship with the Soviet Union as background, Caldwell touched on the Reagan administration and the North Atlantic Treaty Organization’s (NATO) dual track approach to negotiations with Russia, before outlining what is at stake as a result of recent diplomatic developments between the two countries. Citing a number of former colleagues and friends who had recently vacated their posts within government agencies, Caldwell noted that the government’s knowledge of strategy and negotiation is rapidly deteriorating, posing a new kind of national security risk. To counteract this threat, the country needs a new generation of experts, he said. In the 1980s, the Rockefeller Foundation asked Caldwell and one of his colleagues to travel to universities across the country to challenge presidents and chancellors to encourage students to become dual-interest experts. These students would learn both Russian and Chinese and develop knowledge of the two countries in order to assist government agencies. To receive funding for these programs, the universities competed for a $1 million grant. “That program grew out of a close call for war—or war itself,” said Caldwell. 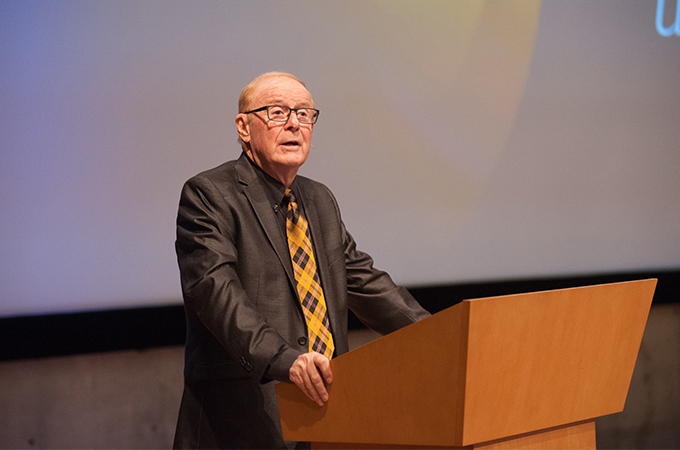 He went on to explain that, as a lifelong professor of political science and the Louise and Cecil H. Gamble Professor of Politics, Emeritus, Occidental College, he is trying to inspire a new generation to become interested in Russian relations. Caldwell noted that students are passionate about the environment and social justice—not so much about Russia—but both areas will be heavily impacted by the evolution of the U.S.-Russian relationship. Within the last five years, events affecting the two countries have included the 2014 Ukrainian revolution, Russian meddling in the 2016 U.S. election, and President Barak Obama’s expulsion of 35 Russian diplomats in response to election hacking. In 2018, Putin gave three speeches about the power of Russian weapons that went largely unnoticed in the U.S. news cycle. While the U.S. may have plans and a large budget to modernize the country’s nuclear weapons, Caldwell questioned if the government has adequate intelligence to know what to do with them. Ultimately, he suggested hope could be on the horizon, citing a statistic that, as a result of the 2018 midterm elections, more people with military experience were elected to Congress in nearly a decade. Next up in the Redlands Forum, which is co-hosted by Esri and University of Redlands Town and Gown, is “Interpreting Lincoln: Forty-One Years in His Company,” by Larry Burgess, historian and director emeritus of A. K. Smiley Public Library. Registration, which opens one week prior to the talk, is required. For more information, see the Redlands Forum website.